Time to change it up on the blog and post our first ever BISON recipe! 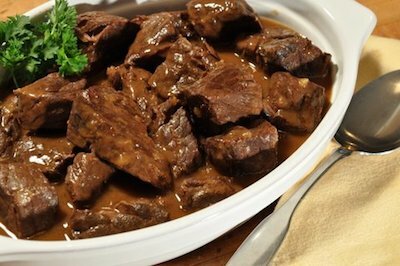 This simple recipe for hearty bison stew is the perfect cold weather dinner and is even better when reheated as leftovers so be sure to make plenty! Bison and beef can be substituted for one another in most recipes, but while they may have similar tastes there are a few key differences. The LiveStrong Foundation notes that a 3 oz. serving of beef sirloin provides 207 calories, while a 3 oz. serving of bison sirloin contains only 145 calories. Bison is also lower in fat than beef, and boasts higher levels of protein. Like any good stew, this recipe is pretty hearty and can be revised based on your particular palette. We recommend adding some onion, potato, celery and baby carrots. Combine flour, ½ tsp. salt, and pepper in big brown paper bag. Add bison cubes and shake to coat. Put cooking oil in large saucepan and put on medium-high heat. Once hot, add the bison cubes. Brown meat on all sides – stirring occasionally. Reduce heat to keep from burning if necessary. Once the meat is browned remove the pan from heat and transfer meat to a 3-4 quart casserole dish. Add the stock to the saucepan and return to medium-high burner. Work a whisk along the bottom of the saucepan to blend in any of the browned bits. Whisk in ½ tsp. salt, tomato paste, whole cloves and fresh parsley. Once combined add the saucepan contents to the meat in the casserole dish. Cover the casserole dish and cook in the oven for 4 hours. Stir stew once after about 2 hours of cooking. Serve with vegetables of choice and warm rolls.